Any T206 "Blank Back" example is extremely desirable, with these seldom surfacing tobacco type cards listed as one of the top 10 scarcest "T206 backs". 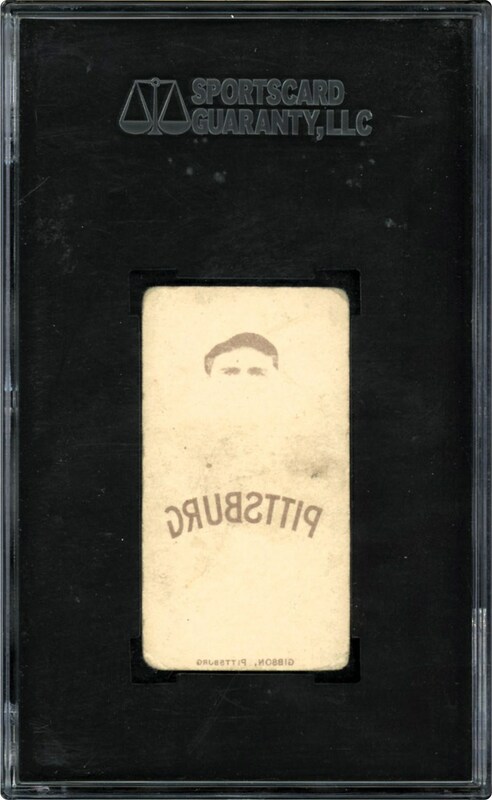 With that in mind, presented here is an extremely rare T206 "Blank Back" tobacco card of Pittsburgh's standout catcher George Gibson in an SGC "Authentic" holder, that to the best of our knowledge, is the only copy encapsulated by either SGC or PSA! Even more impressive than the highly coveted blank back variation is the fact that this "unique" offering includes an amazing ghost image/wet sheet transfer of Gibson on its blank verso! Indeed, while scrapper sheet T206s are very desirable and scarce, this is the first example we have seen that also includes a likewise highly coveted "ghost image" on its verso. Amazing to say the least, the coupled variation of both a blank back and ghost image T206 subject places this extreme rarity as one of the most significant T206s we have ever encountered, and one that merits serious attention from the most advanced tobacco collector. While "blank back" T206's were certainly hand-cut from a factory issued scrapper sheet, this rare offering atypically does not reveal any significant wavy edges. With many "blank back" T206's, "hand" cut specimens are easily noted due to the perimeter irregularities, however, this offering's seemingly straight edges predominately depict factory-like aesthetics. Save the blank-back "hand-cut" issue, the card presents itself in "VG" fashion via a crystal-clear Gibson image that is well centered between four relatively clean white borders. 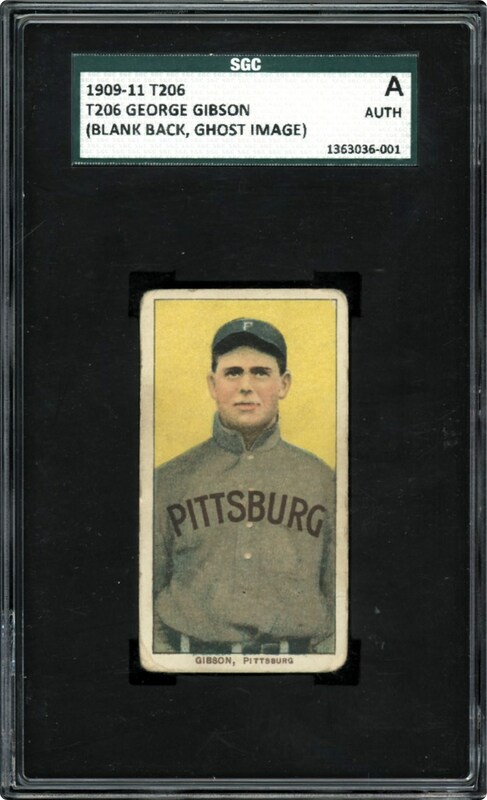 Uniform corner wear actually depicts a nice visual appeal, and the critical blank back includes the aforementioned Gibson ghost image with a sepia-toned portion of Gibson's head and bold "PITTSBURG" both included. A magnificent T206 rarity, it remarkably provides the esteemed enthusiast with TWO major T206 anomalies that are extremely sought-after in the collecting community! Copyright © 2000-2020 T206 Museum Limited. All Rights Reserved.